Just In: Musliu Obanikoro defects to APC – Royal Times of Nigeria. The former minister of State for Defence and a chieftain of the Peoples Democratic Party, Senator Musliu Obanikoro, has defected to the ruling All Progressives Congress, APC. Obanikoro announced his defection at a press Conference in Lagos on Tuesday. Lukman Ajose, a former chieftain of the Peoples Democratic Party, who recently defected to APC, was also formally presented to the progressives family. 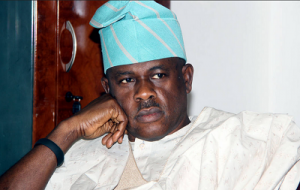 Until their defection, Obanikoro and Ajose were members of the Peoples Democratic Party, PDP. Nigeria politics is just so funny and our politicians &political parties have no values they stand for.